Powerful Online Control Panel| DRM Digital Rights Management Protect Content PDF, Protect MP4, Protect WebM, Protect MP3, Protect WAV. DRM-X 4.0 provide a powerful online control panel, you can easily manage, settings and view reports on your computer, tablet or mobile phone. To encrypt files, it requires that you install Xvast browser on Windows, but for other control operations, you can use other browser to manage on your tablet or mobile phone, and it supports multiple users to login to the Control Panel at the same time. 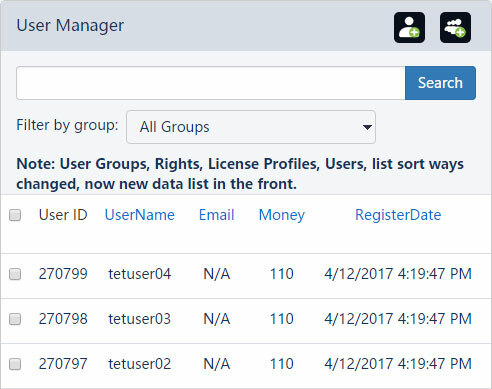 In the user group management, you can create user group, view group users, view reports, edit group and delete group. In the group, you can associate which license profile encrypted file the user group can access. Through the flexible management of user groups, you can set up a sales model based on your business mode.You can also set the number of hardware bindings for the user group in the user group. User page operations include add new user, batch create users, edit, delete, view user binding, revoke user license and view user reports. The user group can easily control which License Profile encrypted files the user can open. If you have your own website, DRM-X 4.0 supports integration with your website. Once integrated, you can use your website database system to control user login and obtain license. DRM-X 4.0 encryption platform uses Rights to control the user’s restrictions on opening encrypted files. In the Rights, you can set open count, license expiration date, allow print or disable print, dynamic watermark settings, blacklist and smart prevent recording, etc. 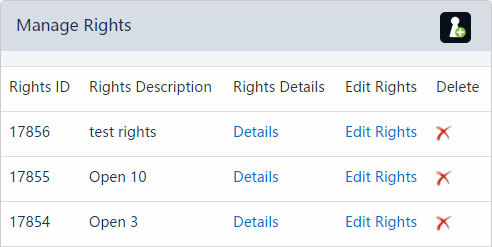 In the Rights section, you can add, edit, delete and view detailed information. The license profile is a profile for encrypt file. When you encrypt a file, you need to select a license profile to encrypt files. The license profile information is also written to the encrypted file. You can use a license profile to encrypt one file or multiple files. When you open files encrypted by different license profile, each file requires a license. If you use one profile to encrypt 20 files, then the 20 files that belong to the same license profile are encrypted and only need to get 1 license. The DRM-X 4.0 encryption platform provides comprehensive report information. 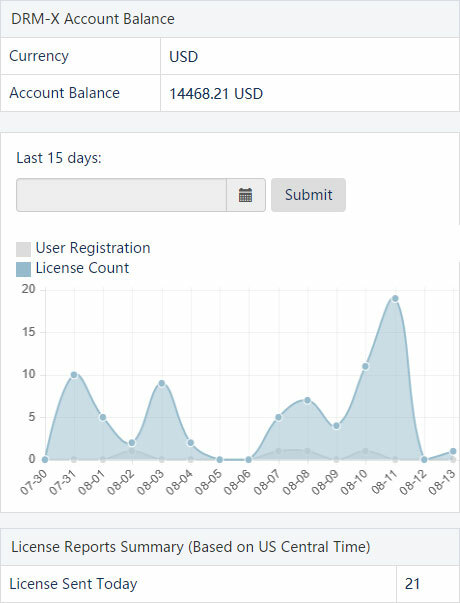 Through the report, you can see the user registration amount, license delivery amount, license reports summary, financial reports summary, and add fund history of your account. In account settings, you can set up your account information, set up DRM-X 4.0 account parameters, and provide some common features. 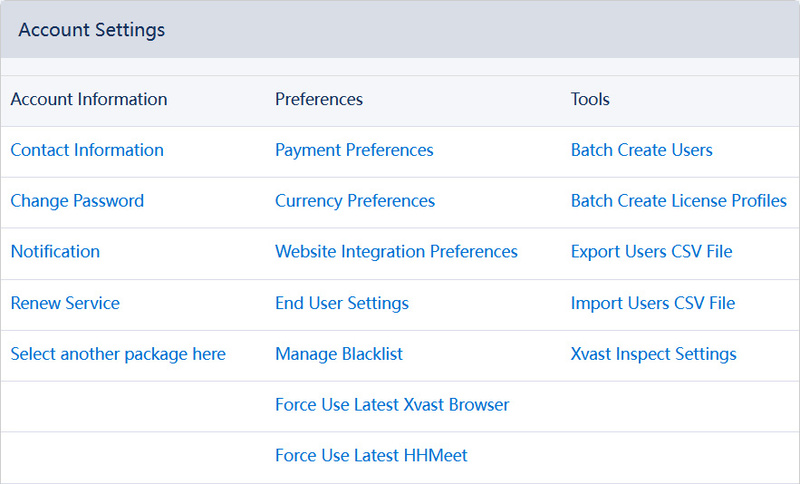 The more commonly used preferences settings include payment preferences, website integration preferences, end user settings, force use latest Xvast browser. Commonly used tools include batch create users, batch create license profile, export users CSV file, and import users CSV file.